Now that the dust of the 2013 InfoComm show has settled, it's a good time– as we head into the busy fall staging season– to evaluate what we as an industry accomplished collectively over the summer. And there's no better place to start than a look at the Rental & Staging Council's hosting of the annual Rental & Staging Forum at the show in June– an event that sought to bring together AV professionals for meaningful conversations, to learn a little, and to give stagers an official platform to interact with InfoComm. Traditionally, the event has always followed a format of panel presentation, a little Q&A and then cocktails and appetizers. Well, this year, the Council decided at their first meeting that it was time to shake things up just a bit. And so we did. In a nice change from staging events and helping make a client look good– I had the honor of hosting, as Chair of the Rental & Staging Council, the Rental & Staging Forum on the first day of the InfoComm show. 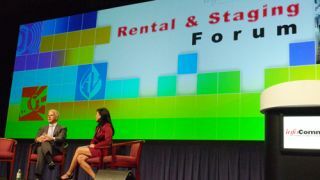 At the Rental & Staging Forum, interactive devices from IML were used to allow attendees to send in questions and comments, as Midori Connolly spoke with InfoComm Executive Director Dave Labuskes about the place of the rental and staging industry within the larger AV community and within InfoComm. With the anonymity provided by the IML systems, intense and even some controversial questions came in– all handled well by Labuskes as he explained his commitment to growing the rental & staging presence at InfoComm. As the demographic mix and technology culture of people attending the events we produce or stage evolve, we’re seeing different expectations and different technology needs, as attendees’ desire for just bigger screens and more intense lights has dimmed somewhat. We now are catering to a hyperconnected group of people who not only want information and entertainment to happen in the palm of their hands not just on stage, but they want to interact with that content– and even drive, to some extent, the overall experience they have at an event. Used now to the ability to vote on the next song in their playset, and experiencing spontaneous light shows on their mobile devices, attendees at live corporate or entertainment events have become active co-creators of the event itself, leaving behind a model where they were a passive audience. With this in mind, the Council decided we should practice what we preach and mix up the format at the Forum and try some new techniques to improve interactivity. We did this in several ways. First, we mixed up the program formatting and had sponsors come up for a few quick and educational words in between presentations, to break up the sessions, help attendees stay focused, and provide some useful new product/service information. We also decided that this would be a great opportunity to learn more about the InfoComm director, David Labuskes. So we scheduled a one-on-one fireside chat (that I hosted) and then followed that with a great technical panel on audio. What really spiced up the event was that we used interactive devices from IML to allow attendees to send in questions and comments. No longer just multiple choice keypads, this Audience Response System allows a participant to either use a built-in microphone, or type their comments/questions into a QWERTY keypad on the device. I was then able to view this content via an iPad onstage and relay them to David for response. What was remarkable about this format were the comments and questions that flooded the Labuskes interview! Without the use of this technology, it is doubtful we would have ever had some of the more intense and controversial submissions. Knowing most of the audience, I can’t imagine a member of that crowd stepping up to a microphone and commenting on the impression that InfoComm has long been focused on the install market and would they be willing to make a change. Ranging from questions on labor unions to weighing in on CTS-R certification and even questions about exclusivity contracts, the audience submitted over fifty comments and questions about topics of concern to them. It was powerful and inspiring. And it must be noted that David Labuskes handled it all with a refreshing candor. It would appear that our association has the right leadership in place. It seems the greatest issue raised by the audience was the perceived disconnect between the association and the Rental & Staging community. It started with questions about the show. Two points of frustration include the date of the show being in the high season for stagers, and the challenge to find exhibitors who showcase Rental & Staging products in their booth – or are trained to understand the role of their products in the events industry. Do you think our industry has a go-to community? Does InfoComm offer the right opportunities for education, networking, equipment research, professional development, professional services, vendors? What is it you need that isn’t being filled? Frankly, unless we specifically and strategically outline what our needs actually are, we are probably not going to get what we want and need. The Forum was a start. Perhaps there needs to be more open dialogue, enabled by various technologies that give our community a voice. Based on the energy and excitement at the Forum, it would appear we have the enthusiasm. Now the next step is…what? More in-person networking events like the Forum? Smaller regional events that compliment the big InfoComm show? (Rental & Staging Roadshow anyone?) More education? Is that hands-on training for techs, or more webinars? These are the important questions that we must organize to answer if we want to progress past sending anonymous comments and questions at a Forum, and actually generate tangible benefits for our community.